I first heard about Ninja Forms on the Apply Filters podcast with Brad Tournard and Pippin Williamson. Apparently they have been around since 2012 but as I was happy with my goto Contact Form 7 and as I didn’t need anything as fancy as Gravity Forms I didn’t think to look into form plugins too often. Then came a project with a very long and complicated form. It was beyond the scope of any of my previous solutions so I decided it would be easier to do it myself. A week and a several hundred test emails later, I vowed to use a plugin next time. I looked at the plugins I had heard about and realised some weren’t as lightweight as Contact Form 7, and more importantly, they weren’t all free. I really don’t have a problem paying for plugins. Some are lifesavers and save me loads of time and effort but I like to keep costs down as much as possible and didn’t want to pay for something unless I really needed it. I amended my vow to convince my clients they didn’t really need a complicated form. If Contact Form 7 couldn’t handle it, it didn’t need doing. I still don’t believe in complicated forms but as it turned out I was the one who needed one. I wanted to streamline the process of requesting a quote on a project for my own site. A lump message in a small textarea wasn’t specific enough for me to judge whether or not I should take on a project. I should mention this could probably be done with Contact Form 7 or most other form plugins but I also wanted an excuse to try Ninja forms. Here is a very basic tutorial outlining how its done: First we draw out the form on paper. This prevents us limiting ourselves by what can be done technically. We don’t want to be influenced by options in the plugin interface when we decide what we want in our form. Then we head to the documentation to see how to go about accomplishing this. I figured the best place to start would be Settings and watched a quick and friendly video about basic calculations which wasn’t the right starting point for me but was good to know. Field settings seemed more appropriate and is my preferred style of documentation. No need to go through all of them (or any of them for that matter) they are clearly explained in the documentation. So we’ll choose a Textbox, an Email, a checkbox field, a list, , a calculation field,a textarea, an Antispam field and a submit button. The textbox I labeled “Name” and the Email “Email” because I’m clever like that. 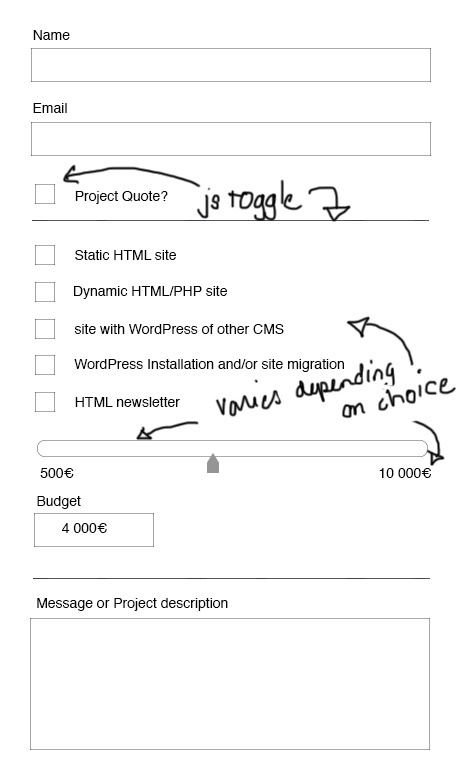 The checkbox would serve as a toggle to show further form fields which consist of our “Type of Project” list, and a Budget range slider which wee will be creating shortly. Then we have a “Message” textarea and, of course, a submit button. We’ll also throw in an Antispam field just for fun. To create our custom ninja forms field we will need to paste some code in either functions.php or in a file included there. We won’t get too fancy with our css (or sass) here but if you want to style the actual range slider it can be done by styling the shadow DOM elements. A good article on styling input type range here. ← Why bother with Semantics? Thanks a lot for this well documented post. Like you that’s the same podcast which convinced me to use Ninja forms. I was a long time user of Gravity forms but the only paid business model make the development less vivid in long term perspective. Thanks for your comment. I’ve been trying out the various form plugins lately and its nice to have a choice. Especially in terms of cost and business models. i am so happy to found your Custom Hire post. Since yet i was working with Contact Form 7. I create the Ninja Form yet, then i have copy the php code into the functions.php. But i am not sure where i have to copy the jQuery code (form.js). Have i to put a link into the header to this js file or it its possible to put it direct into the ninja form? I’m new to this, please help.